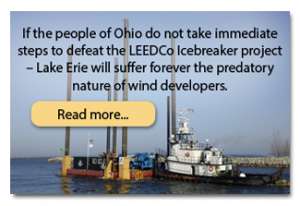 Although the studies focused on golden eagles, if no major action is taken, wind turbines’ razor-sharp blades will also threaten the existence of other species, STEI predicts. 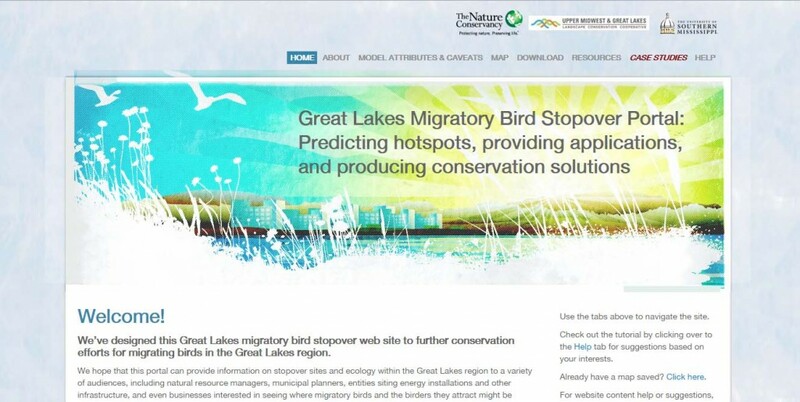 The international group “solemnly warns the Western States that the biologically-blind policies will cause the extinction of the Golden Eagle, the California Condor, and other species of raptors.” Also at risk are species in Eastern and Central states, such as the Whooping Crane. But the devastation is far worse—and could quadruple in the near future. 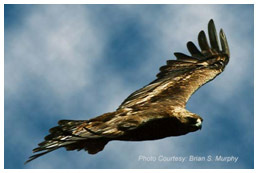 At Altamont alone, 116 golden eagles have been reported killed by the turbine blades each year. 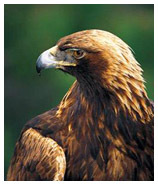 That’s 2,900 dead golden eagles over the wind farm’s 25 year history. Now, regulators have approved reducing old turbines at Altamont with fewer but larger turbines that have bigger blade sweeps—doubling the power output in a move that “could be killing four times as many golden eagles as with the old turbines,” according to SEI. New turbines such as those planned for East County tower hundreds of feet tall with blade spans as large as many jetliners—far larger than the existing turbines on tribal lands. 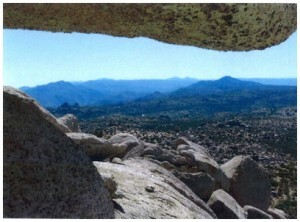 Some are planned on National Forest and Bureau of Land Management lands that until a few years ago were protected as wilderness, but were opened up for energy development by the Bush administration, a step the Obama administration has not reversed but instead, used as an opportunity to fast-track numerous large-scale wind and solar projects in an effort to reduce greenhouse gas emissions and global warming. 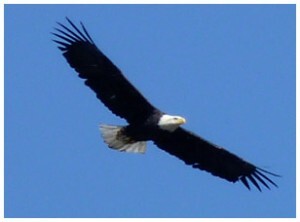 Bald eagle, rare in San Diego County, at Lake Cuyamaca this winter. But are projects that slaughter wildlife really green? 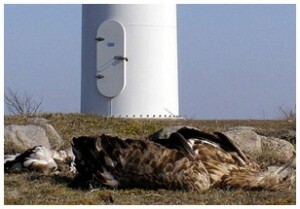 Altamont isn’t the only wind project killing eagles. Federal authorities are investigating deaths of at least six golden eagles at the Los Angeles Department of Water and Power’s Pine Tree Wind Project in the Tehachapi Mountains, the U.S. Fish and Wildlife Service reported in August. Numerous eagle kills are also reported in Colorado and Wyoming. HawkWatch International, another nonprofit organization concerned with bird mortalities, predicts that the Chokeberry and Sierra Madre wind project in Wyoming will slaughter 700 birds of prey a year, including more than 200 golden eagles, the Casper Star Tribune in Wyoming reported on November 28, 2011. Bats have also had populations decimated by wind farms. Even more ominously, scientific studies reported in New Scientist found that bats died in large numbers even when they didn’t strike the blades at wind farms. The bats died of internal haemorrhaging and lungs that literally exploded. The gruesome finding is believed to be due to changes in air pressure caused by the massive spinning blades. Federal watchdogs or industry lap dogs? 2 golden eagles soar over Ocotillo, where a wind farm is planned. Officially, windmills kill a half million birds a year in the U.S., according to the U.S. Fish and Wildlife Service. 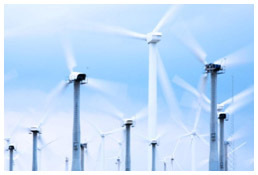 There are currently 500 wind farms a year in the U.S., the Washington Post reported in August 2011. But many more are planned. But Trish Sweanor, a U.S. Fish and Wildlife Service biologist, admitted, “We really don’t know how many birds are being killed by wind turbines,” according to the Casper Star Tribune. The federal agency has largely relied on industry representatives to count the bodies of beheaded and eviscerated birds beneath the giant blades. But avian experts contend that wind farms hide the carnage, burying bodies or carting them off in the dead of night. A citizens’ public records request for raptor kills on a wind farm on tribal-owned land was allegedly denied on privacy grounds. 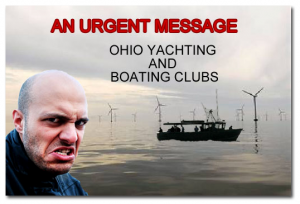 Wind industry supporters have tried to diminish concerns. “The reality is that everything we do as human beings has an impact on the natural environment,” said John Anderson, director of siting policy for the wind-energy association the Washington Post reported recently. Wind industry advocates note that bird kills from wind farms counted thus far are lower than total bird kills from flying into glass windows or being hit by cars, and roughly equal to the number killed by cats. But those perils predominantly kill smaller songbirds; an eagle is more apt to carry off a housecat than the other way around—and soaring eagles nesting in rugged terrain are far more likely to fly into a wind turbine than a household window. Counts of bird kills for smaller species are tougher to conduct, moreover, since a fallen songbird may be carried off or eaten by small animals. In San Diego, where Supervisors are now considering a wind ordinance that would make it easier to build large-scale wind farms in East County, today’s news is particularly relevant. It comes on the heels of last week’s announcement by the U.S. Department of the Interior that the Department had approved the Tule Wind Farm for McCain Valley in East County, though additional approvals are needed for the full project. Many other projects are planned nearby, including a massive project in Ocotillo in neighbouring Imperial County. That has some local residents deeply concerned. 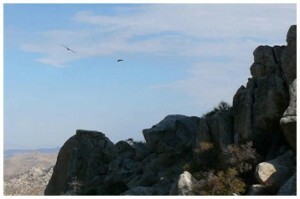 Charles and Laurie Baker of Santee, who regularly hike areas near the proposed Tule Wind Farm and others, submitted photos of eagles in flight and apparently nesting. Wildlife experts, meanwhile, believe it’s time for the state and federal government to take action to halt the massive proliferation of wind farms as evidence mounts of their dangers to wildlife, including threatened and endangered species. “The Altamont Pass wind farm should have been closed down and decommissioned a long time ago,” STEI said of the most infamous eagle-killing facility. “But pork-barrel politics have kept it in operation,” a release signed by STEI president Mark Duchamp as well as Vice President Jim Wiegand, STEI United States. Both have also expressed grave fears for San Diego County’s eagles and other raptors if the wind farms proposed here are allowed to be built. “No amount of bad science financed by the wind industry and government agencies have been able to convince honest conservationists that wind farms don’t harm bird and bat populations,” Save The Eagles International concludes. 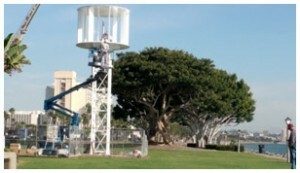 Long-term, vertical axis wind turbines hold promise. To date, only small-scale models have been developed–including one recently installed as a pilot program by the San Diego Port District. “Many of these turbines have been installed throughout Japan and because of their unique vertical structure, there have been no reported problems, like the ones that occur with horizontal axis turbines, such as injuries to bird populations, according to Nakao Consulting and Enterprises,” the Port District’s website states. For now, however, the most promising clean energy alternative for the San Diego region is sunshine. Prominent environmental designer Jim Bell has estimated that our region could meet its energy needs entirely through rooftop solar, including solar on buildings as well as shade structures over parking garages. Large-scale desert solar projects could also produce significant power, though they face their own set of environmental issues. Rooftop solar also lacks the serious negative impacts of other options, such as carbon-producing fossil fuels or nuclear, which has come under growing scrutiny in earthquake-prone California falling the Fukushima, Japan earthquake and ensuing nuclear meltdown. But rooftop solar has no profit motive for utility companies such as SDG&E, that are under state mandate to increase clean energy production. 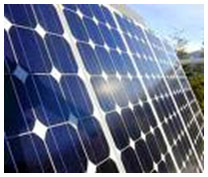 Recently, in fact, SDG&E has been lobbying to impose a fee on homeowners or business owners who want to produce their own solar power. Contrast that scenario to places like Germany, which fast-tracked its ramp-up to clean energy by providing incentives for conversion to solar power across the nation. The fate of our national bird? Will the eagle, America’s national symbol, survive the onslaught posed by spinning turbines across the continent? That remains to be seen– and the future of eagles in the U.S. may hinge on whether federal and state regulators take action to enforce laws against killing eagles. If an individual kills an eagle, it’s a felony punishable by steep fines and jail time. 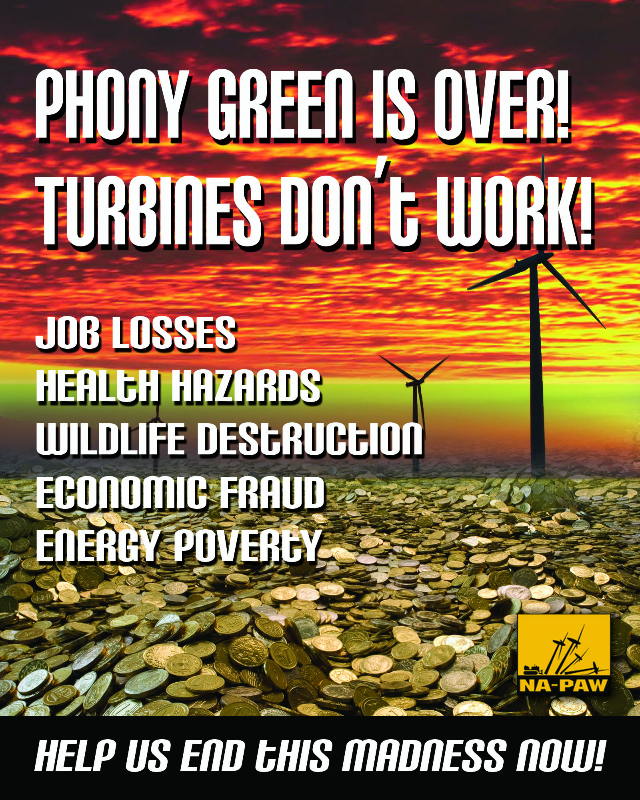 But thus far, not a single wind energy executive has been jailed or even prosecuted despite thousands of unauthorized eagle deaths. 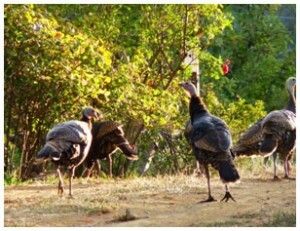 When the founding fathers chose the eagle, Benjamin Franklin dissented–suggesting that the wild turkey be named our national bird instead. Perhaps Franklin’s choice was prophetic, since the wild turkeys in our region have one distinct advantage over eagles: turkeys can’t fly high enough to be slaughtered by wind turbines’ fast-whirling blades.